The right amount of sunshine is essential to life. We rely on it for the air we breathe and the food we eat. Sunshine also affects our moods and our lifestyles too. 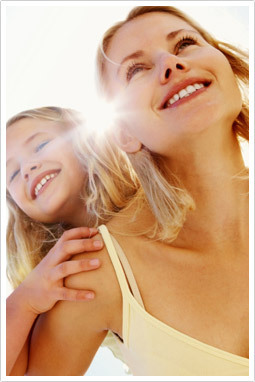 But did you know that sunshine provides a nutrient that is essential for your immune health? Your immune system is responsible for keeping you healthy and protecting you from the millions of bacteria, viruses and toxins that threaten your health. Like the rest of your body, your immune system relies on you eating the right sorts of foods and living a healthy lifestyle to stay healthy. Unfortunately, without the right nutrients there is a chance the immune system will become confused. When the immune system becomes confused, it can actually attack the body itself; this is known as autoimmunity. Although autoimmunity is quite a complex process, we now know that there are key nutrients that can protect your immune system from getting confused in this way. One of these most important nutrients is Vitamin D.
Vitamin D deficiency seems to have a direct link with the development of various autoimmune conditions including multiple sclerosis, Type 1 diabetes and inflammatory bowel disease. When Vitamin D levels are restored, immune cell production and activity is rebalanced and autoimmunity may be reduced or avoided. What does this all have to do with sunshine? programs, which have effectively reduced the incidence of skin cancer in younger populations. So how much sun is enough? It is a fallacy that Australians get sufficient Vitamin D from casual sun exposure; up to 30% of Australians are Vitamin D deficient. In order to produce enough Vitamin D, a person with light coloured skin would need to have their arms and legs exposed to full sunlight for 20 minutes every day (avoiding the hottest part of the day). For a person with dark skin, this exposure would need to be closer to 2 hours a day. The use of sunscreens will block this production of Vitamin D and the exposure needs to be direct; that is not through glass. The elderly, people with dark skin and veiled people are at particularly high risk of deficiency. Finding the right balance of sunlight exposure for optimal skin and immune health can be more difficult than it first sounds. It is possible to stay “Sun Smart” and have immune health too. Vitamin D is present in a variety of foods including cod liver oil, herring, egg yolk and milk. It is also possible to obtain Vitamin D in the form of a supplement, but it is important that you use a supplement with a dose that is right for you and your state of health. For treating certain autoimmune conditions, it may be best to use a Vitamin D that is combined with another remedy, making it really specific for rebalancing your immune system. The herb Polypodium leucotomas is particularly useful for rebalancing the immune system. If you have concerns about your immune health or want help managing an autoimmune condition, please make an appointment to plan a course of action that is best for you. Our highly qualified Naturopaths have the experience and skills to prescribe the most suitable treatment for your needs and help you to understand how to achieve your health potential. Take a proactive approach and call MNMC today. You can make an appointment online, email us, or phone us on (03) 96862566. Our clinic in 49 Chetwynd St, North Melbourne, is open six days a week.